One of the three friends of Job (Job ii. 11). 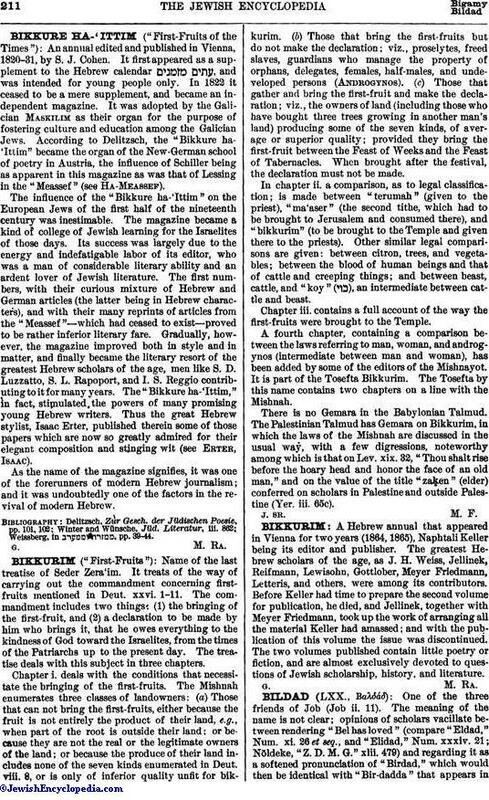 The meaning of the name is not clear; opinions of scholars vacillate between rendering "Bel has loved" (compare "Eldad," Num. xi. 26 et seq., and "Elidad," Num. xxxiv. 21; Nöldeke, "Z. D. M. G." xlii. 479) and regarding it as a softened pronunciation of "Birdad," which would then be identical with "Bir-dadda" that appears inAssyrian inscriptions. Delitzsch ("Wo Lag das Paradies?" p. 298) mentions also Bedad, the father of the Idumean king Hadad. 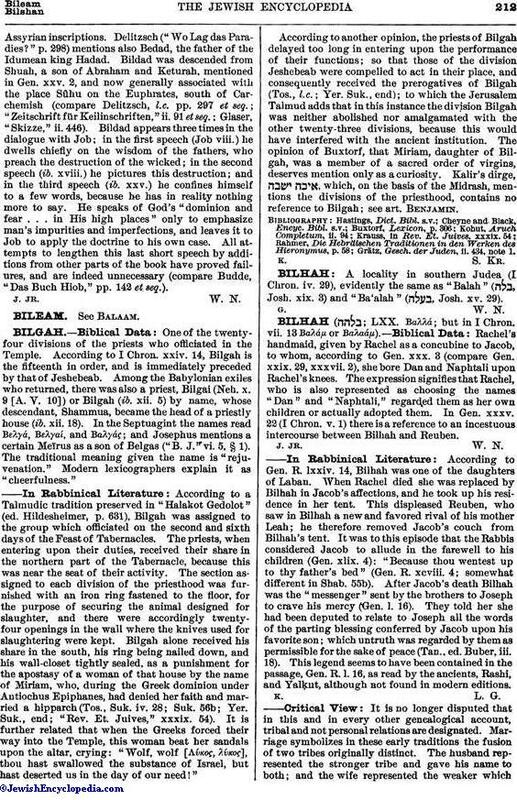 Bildad was descended from Shuah, a son of Abraham and Keturah, mentioned in Gen. xxv. 2, and now generally associated with the place Sûhu on the Euphrates, south of Carchemish (compare Delitzsch, l.c. pp. 297 et seq. ; "Zeitschrift für Keilinschriften," ii. 91 et seq. ; Glaser, "Skizze," ii. 446). Bildad appears three times in the dialogue with Job; in the first speech (Job viii.) he dwells chiefly on the wisdom of the fathers, who preach the destruction of the wicked; in the second speech (ib. xviii.) he pictures this destruction; and in the third speech (ib. xxv.) he confines himself to a few words, because he has in reality nothing more to say. He speaks of God's "dominion and fear . . . in His high places" only to emphasize man's impurities and imperfections, and leaves it to Job to apply the doctrine to his own case. All attempts to lengthen this last short speech by additions from other parts of the book have proved failures, and are indeed unnecessary (compare Budde, "Das Buch Hiob," pp. 142 et seq. ).